Let's Get Our Creativity On! Subscribe to Paper Pumpkin with me as your demonstrator to receive all of the benefits of becoming one of my Peeps! If you're looking for a way to earn money, save money, make new friends, build your self-esteem, spend time doing what you love to do, travel the world, or just need some time for yourself, think about becoming a Stampin' Up! Demonstrator. I would love to share more information about how Stampin' Up! can enrich your life. Whether you join the Sparkles team, or sign up under another demonstrator, you won't regret your decision. Let's chat! Looking for a fun stampin' event? 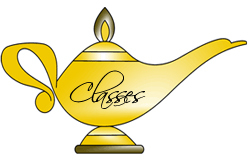 Check out my online calendar for a list of the classes, parties, and camps I have scheduled. Of course, you can always book a party of your own with me to share the fun of stampin' with your family and friends, and earn free products! 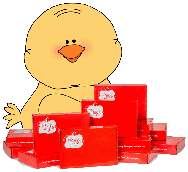 Check out the latest and greatest products offered by Stampin' Up! Once you're on my web site, click "Products". An exclusive web site for my Stampin' Up! team! Want to host a party, but you're not sure who you can invite? Check out the 40 guests in 4 minutes form. You'll be surprised at how many people you know! Here's another one of the projects I was able to complete at the scrapbook retreat. This chipboard album has plenty of room for your holidays photos and journaling. Each pocket page pulls out to display a 4 x 6 photo on both sides, plus the pocket pages can display photos too! This would be a great gift to give to your family and friends as a Christmas present, as a remembrance of the holiday, or as a thank you gift. It's sure to be treasured year after year. Contact me to order your kit today for only $30 plus shipping. You will receive everything you need to complete the album including the I Wish Simply Scrappin' kit, Chipboard covers and embellishments. If you like this album, wait 'til you see the 6"x6" Photo album! Back by popular demand, I'll be creating the brag books on a regular basis once again! 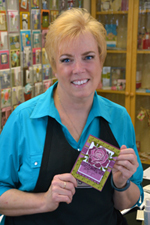 Hi, I'm your creative Jeanne and would love to be the one to help make all your stampin' wishes come true! Click on my picture if you would like to know more about me. Click on the shopping cart above to visit my Stampin' Up! website. 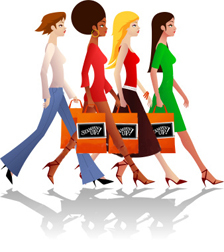 Once you're there click the SHOP NOW button to shop any time, day or night. It's quick, easy and the fastest way to get the supplies you want NOW! 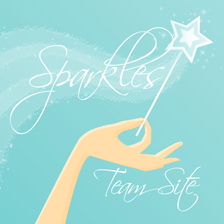 Benefits of joining the SPARKLES TEAM! New Products - Exciting news!